It was very windy through the night but it didn’t worry me too much as I was sound asleep! It was still quite warm. Terry, our host, passed us on our way into breakfast with a shotgun in his hand. He was on his way out to get dinner for the night – we ate freshly roasted kangaroo and damper that evening! After our breakfast on the verandah in the early morning sunshine and our wifi fix was satiated, we left in the troop carrier with Sharpie for day 2 of walking the River Frome. We were driven through the Angepena Homestead property to Mudlapena where we had finished our first day of walking. The Frome River is the only River to flow north into the world renowned Lake Eyre, from high in the equally world renowned Flinders Ranges. From its watershed it drops about 739 metres over its 319 km length to Lake Eyre. Our aim is to do a reconnaissance walk along the 110km of the mountain section to where it crosses the Strzeleckie Track. Even this section has been divided into 2 stages because, although part of our mission is to travel the distance, the most important part of our mission is to travel ‘in the spirit’ of those whose country this has been for 50000 years. And so this is a guided Cultural Walk in Adnyamathanha Country, led and supported by Adnyamathanha people. The term reconnaissance is used because we are not following an already prepared walk but working with our cultural guides to determine the best course, information points, pace, points of interest, and to suggest what and where infrastructure may be required. Iga Warta Pty Ltd provides all meals, guides, Cultural information and support. We were reminded again that this is an ancient and traditional walk, and could be compared to the iconic Camino walk in Spain. We were encouraged to wash our hands or face in the water to connect to the river and Mother Earth. The walk took us through magnificent gorges, waterholes, more exciting rocks and along the river bed. We met up with Sharpie our guide at various points along the way and he again told us stories of the ancient Adnyamathanha people. We ended up walking about 9kms finishing at the Angepena Homestead, where the creek meets the road. That afternoon the place was jumping with car loads of people arriving for a few days of camping and looking for a cultural experience. We shared a great meal and even better conversation around the table that night. Life is good!! You can also find Deb’s World here – I’d be delighted if you’d join me. Thanks for sharing your walk. That waterhole picture made me gasp at the loveliness!! Thanks Jodi, it’s such a beautiful area. I appreciate your lovely comment. It is a wonderful opportunity which we are really enjoying. Yes the dryness has been unexiected. Luckily some of the waterholes have water in them. The main rain comes over summer apparently. Glad you like the photos!! It’s been awesome and the connection is palpable. Oh wow, that’s great to know!! This just sounds like such an amazing walk!!!! I didn’t expect it to be so spiritual I must admit, but it’s certainly had an impact on me that’s for sure! This sounds amazing. Forgive me for asking, but what does kangaroo taste like? The views look incredible. Thanks Angela, it’s a beautifully picturesque place. Kangaroo is quite nice and is very lean meat. It really depends on how it’s cooked as to how it tastes. We had it in a stir fry and on the BBQ so it didn’t taste much different to beef. 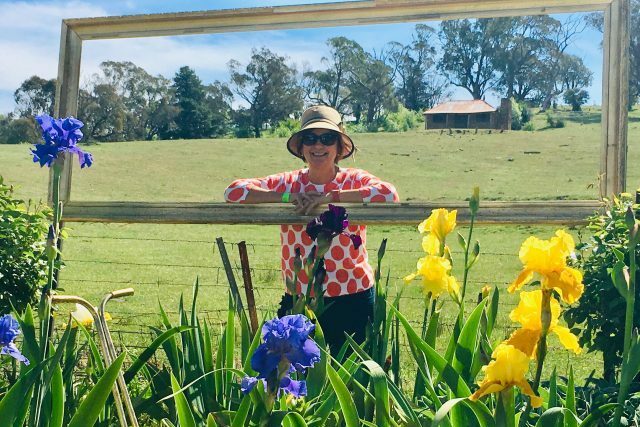 Im pretty much living my Aussie travel dreams through your posts Deb! That’s perfectly fine by me Suzie!! Glad to have you along!! Thanks Melanie, it’s been a fantastic adventure. Glad you can get a glimpse of what it’s been like for us through my posts and and photos. Yes it is gorgeous Sue, thanks for stopping by. I’ll be back reading blogs again soon, I’ve missed you all. Yes I’ve missed you too and I’m away for the whole of October which is very close now. You must be getting excited about your trip! We’ll be in Brisbane late October if you’re back by then?? Love your posts on this trip! i am from Sydney and have always wanted to head over this way to see these beautiful places! You’re extremley lucky! Hope u guys can read my adventure stories! Wonderful! Check out my blog if you have a chance. Mcgeetraveltales.com. Thank you and safe travels!